I had just imagined that whenever March rolled around, for as long as I had the desire to keep writing and photo-clicking away here at a farmgirl’s dabbles, that I’d feature some new way to enjoy German chocolate cake. Because it’s my dad’s signature birthday cake, and I always try to find ways to recognize and honor family members and special people in my life through the wonderful tool of food. But there’s no German chocolate cake coming from me this year for your birthday, Dad. Sorry. During the holidays, I was introduced to Black Licorice Caramels and they rocked my world. I immediately knew they would be Dad’s next birthday treat. Black licorice is to Dad what dark chocolate is to me! My dad. A man who’s been there from the very beginning. He’s a kid at heart, and always seems to have just the right advice at just the right time. I don’t know life without him. Our firstborn daughter. What a beautiful feeling it was, almost 12 years ago, to be in labor (not a beautiful feeling) on our way to the hospital, in the early morning hours of my own dad’s birthday. The sky was crystal clear and sunny bright. And the air was crisp and chilly, lending a shimmery layer of frost to every branch and fence post. Hatti took her time, waiting until late that afternoon to finally scream her way into this world, but what a welcome sight and sound she was! The photo above was taken on our family trip to Mexico last fall. Dad and Hatti call this their “birthday buddies” shot. Even though I am not a huge fan of anise, I find these black licorice caramels to be irresistible. I like black licorice in small and mild doses, very much the opposite of my dad. I could not quit popping these into my mouth! My parents are spending some time in Florida right now, escaping the cold and snow at home in South Dakota. So we packaged up a tin of these black licorice caramels and mailed them off to Dad last week, an early birthday treat. I was sure to include a note that read, “please share with Mom”, to make him think twice about hiding them all for himself. Knowing that Dad and Mom have been spending their time along Florida’s gulf coast made me dig into the old photos, reminiscing about the times we visited my grandparents there when I was young. 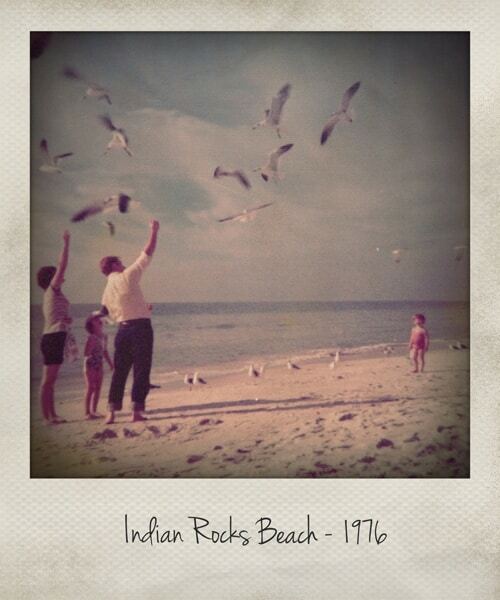 I have vivid memories of Dad and Mom teaching us how to feed the seagulls, and found many different photos from various beaches along the Gulf of Mexico and Atlantic Ocean as proof. But this photograph is my favorite. Mom, me, Dad, Cheryl. And you can’t see her in this picture, but baby sister Jessica is on the beach, too, crawling in the sand close by. I can hear the sharp call of the gulls and my parents’ reassuring tutelage, telling me to hold my hand high and my body still. And then I feel the piece of soft white bread snatched from my fingers. Some of my best memories. Ever. 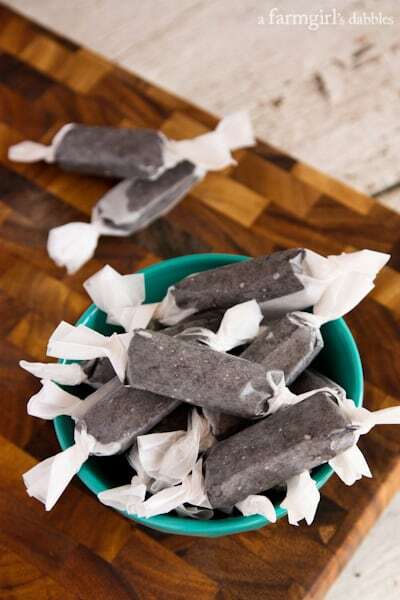 These black licorice caramels are soft and buttery in both texture and flavor. The anise doesn’t bite you. It’s much more mellow. And did I mention buttery? So good!! Lightly spray a 9″x13″ pan with cooking spray and set aside. If you want to be able to lift the full slab of caramel out of the pan to cut it, line pan with parchment paper, leaving an overhang on the long sides. In a large heavy sauce pan over low to medium heat, melt the butter. Add sweetened condensed milk, sugar, corn syrup, and salt. Place a candy thermometer on side of pan, taking care to not let it touch bottom of pan. Stirring almost constantly, cook on medium heat to 234° to produce a soft and chewy caramel. Cook up to 244° for a firmer caramel. Remove from heat and stir in anise extract and black food coloring. Pour into prepared pan and let cool for 30 minutes on the counter. Place in refrigerator to cool completely. Cut into pieces (mine are about 3/4″ x 2″). 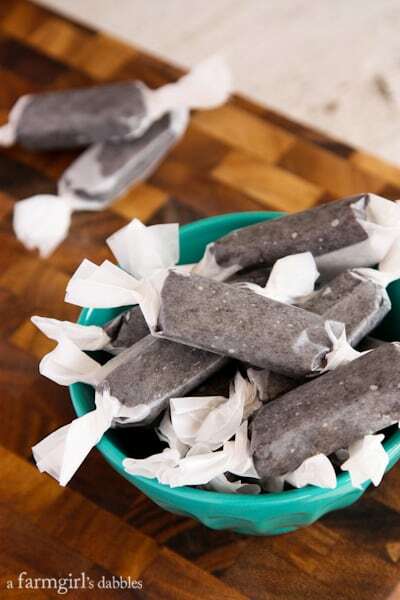 Wrap in wax paper. Enjoy! 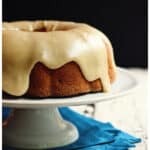 From the recipe box of Dana who blogs at Afternoons and Coffeespoons, originally from Food.com. Per Maria’s comment on salted black licorice caramels, do you know how I could make your licoricr recipe into the salted caramel version? I had it once from a German Candy Co., and they blew my mind! It was like all my favorite flavors rolled into one!! Any suggestions? These are so good!! If you make this, prepare to give a bunch away because you won’t be able to stop eating them. The licorice/anise flavor is actually really miid too, it’s very nice. I left out the food coloring. My dad’s favorite. I think I need to make them for him (and me!) again soon! Great post! My friend is requesting that I make this for her. Does the recipe call for 1 and 1/2 cups of corn syrup? The mark between the 1 and 1/2 was throwing me off and I want to make sure that I have it right. Thank you! These sound amazing. Perfect for the licorice lovers in my life. Happy birthday to your dad and Hatti! Thanks for the birthday wishes, Brenda! Good golly miss Brenda these are faboosh! 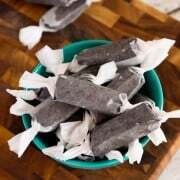 What a great story, and a delicious recipe for the licorice lovers of the world! Bought some anise and black food color today. Have another black licorice lover here. What a happy day for such a happy wonderful family. I hope it’s the start to another wonderful year for all! What a lovely blog post. Shared birthdays are very special. Birthday wishes to Hatti and your dad. I am glad the caramels were well received. Ohmahgosh, girl! 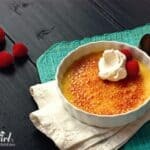 I am totally loving this post and this recipe. I just adore black licorice and caramels. Seriously. Cannot wait to make this! You must do yourself a favor, Brenda, and shoot this again with an orange candy bowl and some pumpkins, etc. for festive Halloween snaps with your gifted photography. 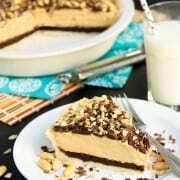 The recipe will go viral in late summer and early Fall at Pinterest! Love, love, love. Thanks for sharing! You’re totally right. But I couldn’t wait. These were meant for Dad. Thanks, Stacy! Just curious–what color would they be if I skipped the black food coloring? Hi Lisa – they will be a normal caramel color/golden brown without the coloring! I, too, am fond of black licorice!! I am even fond of March 20th as I am also a “Spring Chicken” and the older I get, often that is the only “spring” I have. Enjoy your blog and I will try the candy recipe. What a fabulous treat! I can’t wait to try these! This is so right up my alley! I just opened an all black bag of jelly beans this morning! thanks for sharing! I think black licorice is an acquired taste. I would never touch the stuff when I was younger, but LOVE it as an adult. I will definitely be making this soon. Happy Birthday to your loved ones! I love black licorice. Yum! Yum! I look forward to making this. My hubby and I love black licorice! Thanks for posting! Such a beautiful post, Brenda! Love this! Happy Almost Birthday to your Dad and Daughter. 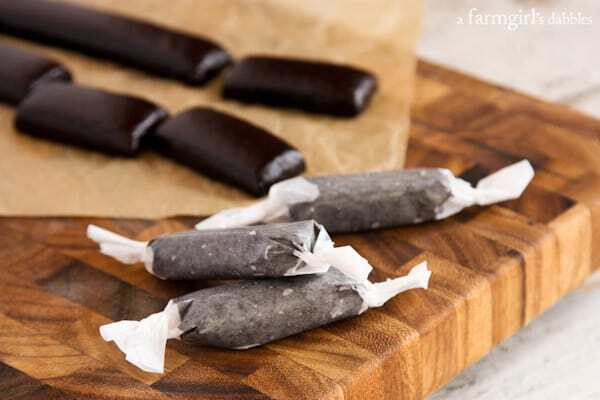 We have a lot of shared birthdays in our family, too, and black licorice is my dad’s favourite thing! I’ll have to make this for his birthday in June. This sounds incredible! And happy upcoming birthday to your dad and daughter. 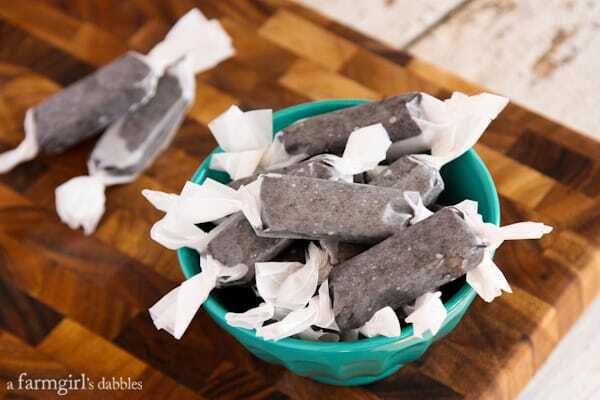 I love, love black licorice, even the salty stuff, but have never made my own. Will have to fix that.. These look really wonderful. Such a lovely post! Oh, I love this post, and lovely pics! Made me smile. Great recipe, too! 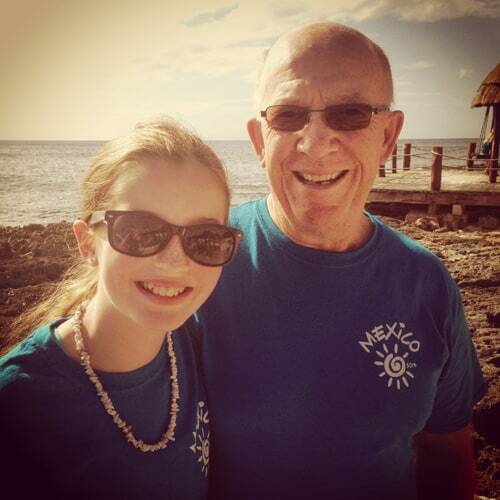 Such a sweet post, Brenda, Happy birthday to both your Dad and Hatti! These caramels looks awesome!